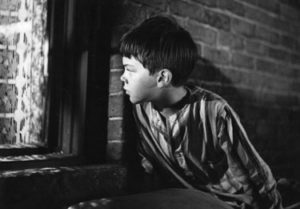 A nine year old boy witnesses a murder through a window in his apartment building. He tries to convince everyone about the crime, but after hearing so many tall tales from this overly imaginative kid before don’t believe him about this murder. His parents don’t believe him, the police laugh the kid off, but the couple who did the killing are taking him talking about it very seriously. As you probably know, witnesses to a murder is not a good thing to have around, so the nasty culprits go about trying to silence this one for good, even if he’s just a little kid. I happened upon The Window somewhat unexpectedly and it hooked me right from the start. 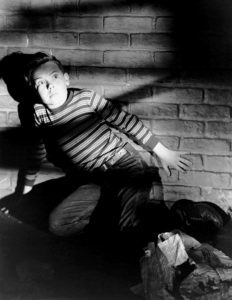 It’s a pretty dark thriller with the very rough backdrop of a slum apartment building all told from the perspective of young Tommy who’s played by the very good Tommy Driscoll. This could have been merely an ‘ok’ movie instead of a ‘really good’ one had it not been for his sincere performance throughout it. It’s a nightmarish updating of the famous ‘Boy Who Cried Wolf’ tale. The opening shot is great as we watch the boy pick up a gun. It’s a bit of misdirection and thrusts us into Tommy’s imaginative world from the get-go. You also understand the rough life these characters are living in this lower working class environment. Vacant buildings, apartments with no luxuries, uncomfortable summer heat. The most fun the local kids have are chasing after fire engines and seeing what’s burning down in this decaying urban landscape. One of the components of a film noir are all those dark shadows framing characters and ominously being cast into rooms. One thing that stood out to me with The Window is the way director Ted Tezlaff utilizes the surroundings of this lower class setting and constantly reminds us of it. He creates a very stark and tense mood. Instead of the shadows of window blinds falling elegantly on characters faces it’s window bars, city grates, clothes lines, chain link fences, fire escapes. Just the use of these images convey what a rough life these characters exist in. 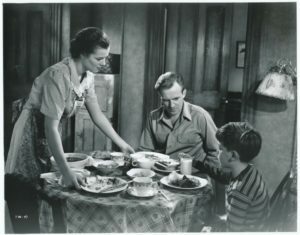 Barbara Hale and Arthur Kennedy are Tommy’s put upon parents who seem to be at their wits end with this kid. You sympathize with their predicament and their growing concern that maybe Tommy isn’t all right in the head. Although, I can understand why a kid would want to live in a make-believe world than the one presented here. Kennedy has a warmness towards his son even when it’s obvious he’s getting aggravated with his son’s consistent pleas that he’s telling the truth. 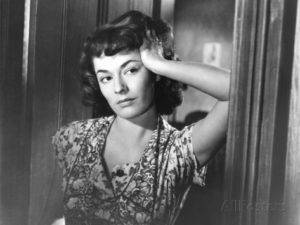 The killing neighborly Kellerman’s are Paul Stewart and Ruth Roman. Stewart I suppose will forever be known as the butler in Citizen Kane who heard the name ‘Rosebud’. This is probably the biggest role I’ve seen him in and he’s very good. Stewart is callous and calculating. He has this subtle intimidating demeanor as he’s lying to Tommy during one early scene. He was an unsettling presence and right from there I was rooting for Tommy to get away from this guy. Roman has a bit more of a conscious than her husband, but not enough that makes her not go along with his plans. Initially I didn’t recognize Roman. I’ve become much more familiar with her from Strangers on a Train in a more glamorous looking role than here. But she looks stunning in this – I think she looked more beautiful here in her plain house dresses than the evening gowns in Train. There was something about her in this that I just found particularly captivating. Once the murdering neighbors learn of Tommy they go about to cover their tracks. Tommy’s life is in jeopardy and he has to save himself. It gets wonderfully nail biting. I was actually surprised how brutal and heartless the Kellerman’s become towards Tommy. They don’t pull back from what their aiming to do to this kid. It amps up the suspense of whether Tommy can escape from the killers and the third act delivers on plenty of suspense. The Window is a great little gem. After watching it I read a bit about it and was surprised to read that an intended remake was planned for it at one point. Somehow a direct remake was abandoned and an updating was decided on that eventually turned into Cloak & Dagger in 1984. I had been a fan of that film since it came out and was never aware of that. It does make sense though. I definitely can see the connections between both movies. It would actually make a great double-feature – The Window and Cloak & Dagger. Wow, this sounds like an interesting film. A film that has a harsher vision of American life. Not one that presented everything as big homes with white picket fences. To be fair, I can think of other films that do this. [B]Bigger than Life[/B] for one. But it does show that if they had wanted to, Hollywood could have explored darker themes. 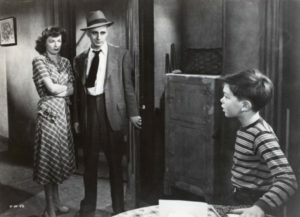 I also love Bobby Driscoll. As a child actor he had a heck of run. Sounds like in this film he hit it out of the park again. For myself, he will always be the definitive Jim Hawkins in Disney’s wonderful Treasure Island. That film set the standard that all later follow. Even [B]Pirates of the Caribbean[B]. It will probably be the only Disney film where a child had to defend himself by shooting someone in the face with a gun. I’m going to seek this one out.